Great colour and great shading! I like the color combination and the tangles you chose work so nicely with this pattern. I love the colors! They look great together. I too like your choice of colors. I also like how you balance them in the tile. This is a very nice tile. Nice job. I think it is hard to get much detail with the Gelly Roll pens, but I like to use them as well. I like the texture of your paper. Nice colors and design-refreshing! Happy New Year! I love your colors. And your choice of tangles, too. Very beautiful; I like the colors and also the dots on the 'border'. 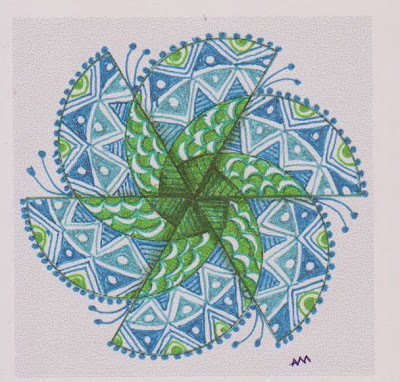 I like this a lot, especially the way the colors work together and support the tangle patterns you've chosen! Beautiful! p.s. love the birdie background on your blog too!